Lenten Days are desert days. Spring is around the corner, but only teasing us of the green to come. New life follows the winter’s death. It is a seasonal thing and how appropriate Easter is, to remind us of hope eternal. No matter what hardship, there is new life, no matter how long it seems that we have to wait for it. Charles Krauthammer says that life rarely goes according to our plans and it isn’t that it falls short that matters, but how we respond when it does that is critical. Though I am without his exact words, his message is clear and he lives it every day of his life, having been paralyzed in his young adulthood. He is living a very full, productive and successful life, complete with career, wife and family as well as awards beyond even his expectations! I have had a lot of desert days, and I remember taking a retreat and talking to a priest about what seemed to be a fallow period in my life. “All lives have desert days,” he assured me. “It is a time that we are pushed to grow our roots deeper, but always remember," he added, “there is beauty in the desert”. 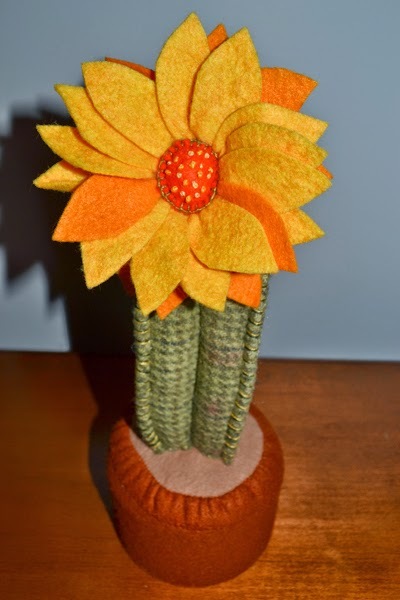 A couple of weeks ago one of my customer’s daughter’s wrote to me to ask if I would please make her a cactus pincushion. She loves cacti. I agreed, although coming from Colorado, where nothing but cactus grew in my neglected garden. I wasn’t so fond of cacti, and instead always preferred mountain meadow flowers that required more moisture, and now I love living in Vermont where wild flowers and day lilies are like weeds and even neglected gardens grow well! 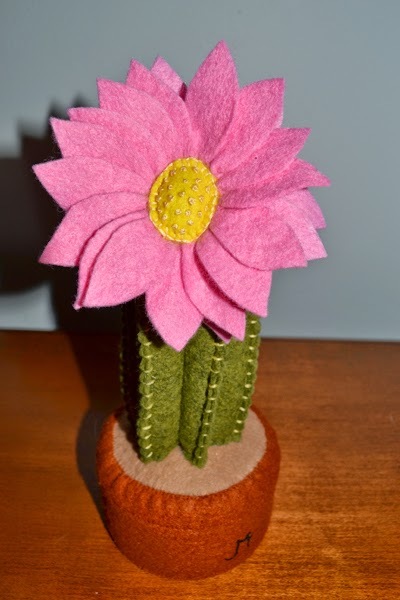 I love making flower pot pincushions and agreed to make my customer’s daughter, Joy, a cactus pincushion, though I whined a bit about the project pulling me away from my new high of making quilts. My daughter assured me that I wouldn't be sorry and she was right. Thanks to my customer's request, I will now have a new line of pincushions that are some of my prettiest ever! 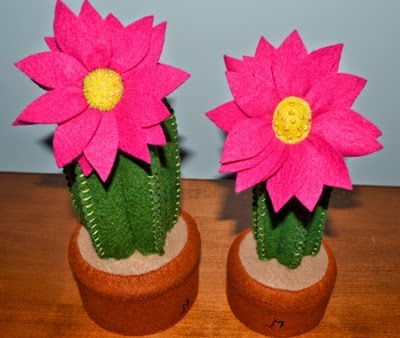 And how fitting it is that my new line, Cactus Joy Pincushions appear during the season of Lent, albeit the very end of this season and are to be named after my customer. The advice given me years ago is right on!! There is beauty in the desert if we but look around to see it and what joy it is to find it during fallow times. I don’t think it is by accident that my husband’s luck, which had recently gone from bad to worse, following his lay-off from a twenty-two year position with a well-known, international retailer to a job, that while looked promising, proved to be anything but. Now he has two new jobs that he may not have considered a year ago, that appear to be an oasis in the middle of the desert. It took “desert days” of thinking that we would never again be financially secure to appreciate these new and exciting opportunities to work with people that seem to be fair and honest, with little commute, less stress, good stimulation and benefits lasting even into his retirement years! 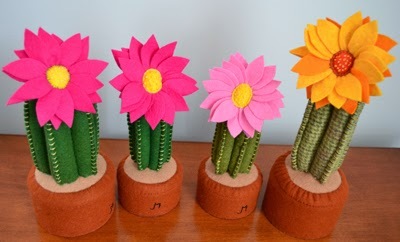 The desert makes for deeper roots, beautiful unexpected blooms and joy that may well surpass what was before! This has proven true for me as well--my chronic illness and disability allowing me the time to do what I most love: writing and sewing. There is beauty in the desert and new life that springs from fallow ground if we but keep the faith, keep on trying and remain open to new possibilities!